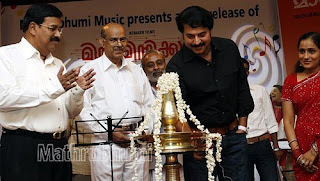 Megastar Mammootty inaugurated the new venture of Mathrubhumi, 'Mathrubhumi Music' last day. Minnaminnikootam, The first audio release of Mathrubhumi Music was also in the function. Director Kamal has released the songs of his latest movie Minnaminnikoottam.Two songs of the movie are youth-oriented fast numbers. Manjari, Sayanora, Sujatha Karthik, Vineeth Sreenivasan, Renjith , Soumya, Sissily Raghuram and Raghy are the other playback singers of this album. Minnaminnikoottam, with a gang of young actors including Narain, Jayasurya, Indrajith, Meera Jasmine, Roma, Samvrutha and Radhika, is now in its last phase of shooting and will grace theatres on 12th July.